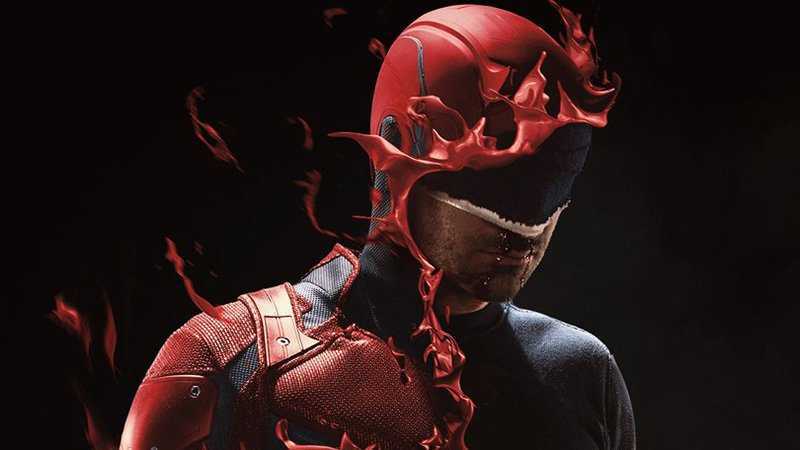 Daredevil is back and more brutal than ever in his third outing on Netflix as the show goes back to its roots and focuses on the core characters, as the season is no longer burdened by setting up an event crossover – and its all the better for it. The original black suit is back as well as the brilliant Wilson Fisk, and they both have a score to settle. This season forgets all of the other Marvel Netflix characters in favour of concentrating entirely on the show’s street-level elements, resulting in a grounded and gritty show with superb performances, intriguing storytelling and some of the most relentless and excellent fight sequences we’ve seen. Based on the iconic 1986 comic book story arc ‘Born Again’ by Frank Miller, the third season picks up straight after the events of The Defenders which saw Matt (Charlie Cox) bloodied and beaten, but alive, following an entire Midland Circle building falling on him and Elektra. 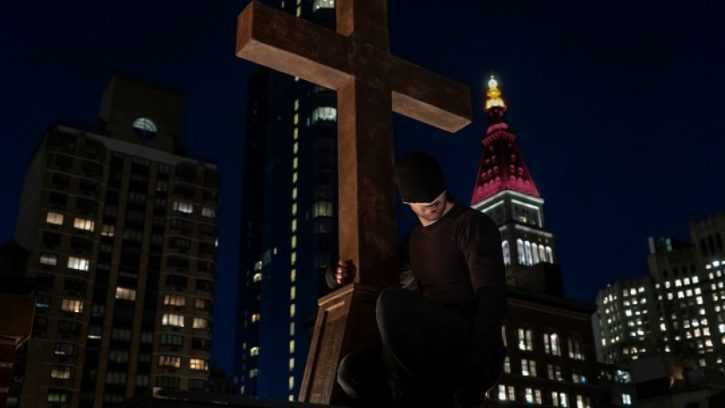 With the Hand out of the picture, new showrunner Erik Oleson focuses on the convalescence of a broken Matt Murdock by tough loving mother Maggie (Joanne Whalley) at the Catholic orphanage where he was raised. Matt is struggling physically, mentally and spiritually – he’s having a clear crisis of faith and purpose, doubting whether his achievements as the Devil of Hell’s Kitchen have actually amounted to anything. And it’s hard not to blame him, as criminal mastermind Wilson Fisk (played by the phenomenal Vincent D’Onofrio) turns informant to the FBI in exchange for a penthouse rather than a prison cell. Matt, Foggy (Elden Henson) and Karen (Deborah Ann Woll) sacrificed so much to put Fisk behind bars, and for what? The start of the season is undoubtedly a slow burn as the pieces are slowly assembled into place; it takes time for Matt to heal, re-train and finally return to his life in Hell’s Kitchen, bringing together Foggy and Karen to aid him in investigating the circumstances of Fisk’s ‘release’. Just how far does the Kingpin’s control reach? Meanwhile the man in question silently watches his plans (upon plans) come into fruition, manipulating those around him by planting just enough doubt at key moments – cue FBI Agent Poindexter (Wilson Bethel), an expert marksman who’s troubled past might just be the key to Fisk’s master plan. Once everything’s set up in place, the ante completely ramps up and the show truly comes into its own – delivering a blistering second half of the six episodes provided to the press. Charlie Cox is superb at portraying a wounded but dangerous Matt Murdock, driven back from the brink by his singular desire to bring Fisk down once again – but at what cost? Frank Castle rightly pointed out Matt’s struggle with his morality – could he ever beat Fisk using all means necessary? Back once again is D’Onofrio’s Fisk, who’s undoubtedly the best Marvel Netflix villain (only closely matched by David Tennant’s Kilgrave), following his brief appearance in season two. D’Onfrio brings so much presence and range to the screen; balancing calm and calculated one minute and full of rage the next. And yes we get the iconic white suit! But newcomer Wilson Bethel might just steal the show as the mysterious and troubled Poindexter. Much like Iron Fist‘s Typhoid Mary, Poindexter is a complicated character that struggles with mental health and Bethel brings a fantastically layered performance to the table. He’s a very interesting mirror to Matt Murdock and their eventual face off is everything you hoped for! As previously mentioned this season is darker, grittier and more brutal than ever – showcasing one of the most impressive, relentless and violent scenes that rivals, and even tops, the iconic corridor scene from season one. The thing that I love about this series is how real it all feels, the sound design is cleverly engineered to immerse you in the head space of Matt Murdock as he struggles with regaining control of his abilities and senses, due to his injuries. You seem to hear and feel each blow in the brawls and much like the opening scene of Casino Royale, you feel the struggles. There’s a raw and frenetic energy to Matt’s fighting this time round, and without his faith to guide him, he truly lets the devil out. 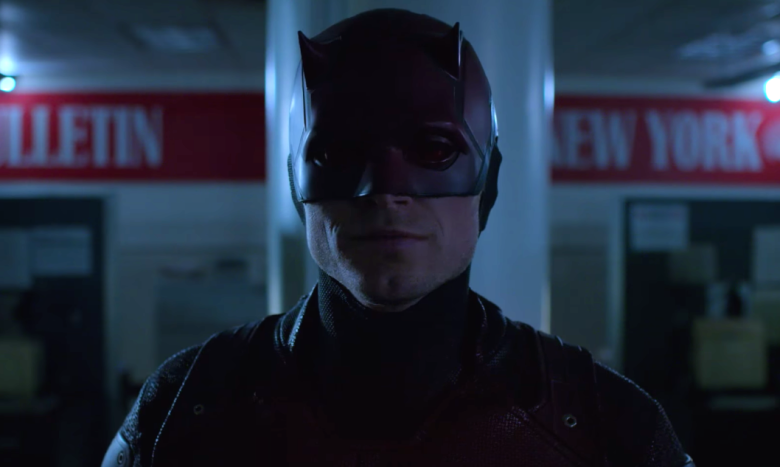 So far Daredevil season three is a real return to form for Netflix’s flagship Marvel show and possibly the true to its source material I’ve seen so far from a comic book adaptation. Yes the first couple of episodes are pretty slow, but the tense build up to the gripping final scene is definitely well worth the wait, and I genuinely can’t wait till October 19th when Netflix releases the rest of the show! Following the shock cancellation of Iron Fist, I’m hoping the quality and reception of this season will cement its position on the streaming service.